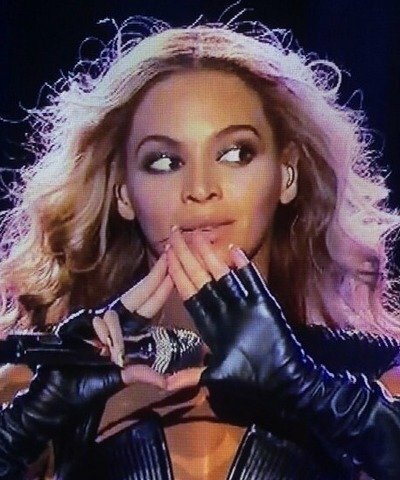 Did Beyonce Flash Illuminati Signs At The Super Bowl? Beyonce’s Illuminati Super Bowl shoutout is the latest conspiracy theory to grip the web, as viewers clearly not familiar with New York rap culture assumed the star’s flash of a triangle formation with her fingers was a secret symbol to the shadowy alleged group — a secret signal Beyonce displayed during the most viewed television event all year, naturally. While Beyonce’s Illuminati signs seem to some a clear indicator the shady global elite is hard at work and paradoxically using one of the world’s most high-profile performers at one of the world’s most high-profile events to conceal their existence and massive international operations, others pointed out a potential hole in the theory. For fans of rap music, Beyonce’s illuminati Super Bowl display appears far more likely to be something else, something a bit more explainable in context. As we all know, Bey is married to Jay-Z, rapper, mogul and head of Roc-A-Fella records.